EverWeb 4th Anniversary Review: A Year of Big Features! 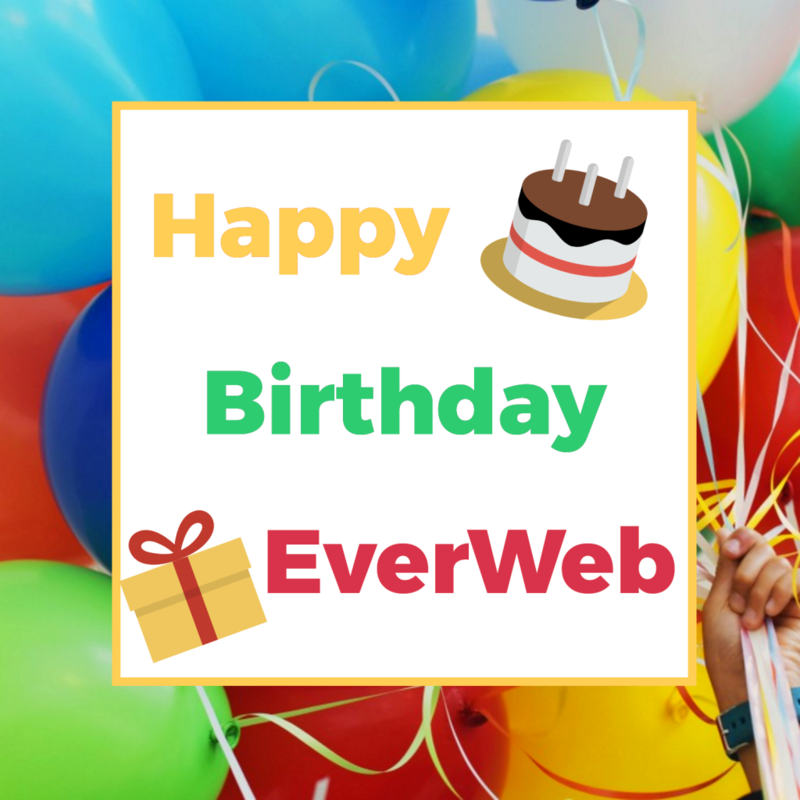 This week four years ago we launched EverWeb version 1.0 to the world. It’s been a great journey so far and we couldn’t have done it without your help, support, loyalty and feedback! Thank You! Undoubtedly the most requested feature for inclusion in EverWeb, blogging debuted in November 2016. EverWeb’s fully fledged blogging environment retains the look and feel that iWeb users are familiar with whilst adding some great features: A choice of Comment Engine (Facebook Comments or Disqus), easy iWeb and WordPress blog post importing, an RSS Subscribe button, Master Page support and much more… Check out the full details in our Introducing EverWeb version 2.0: Blogging Comes to EverWeb feature. Our new Animation Engine put style, and fun, into your website pages when EverWeb version 2.2 was released back in April. Over 16 great animation effects were introduced in a typically easy to use EverWeb way through the Shapes tab. Animations are great way to draw your visitors attention to where you want them to focus on your page. Find out more on how to use this feature in our Create Great Animation Effects with EverWeb! feature. This is one of EverWeb’s most important feature additions ever. If you have an EverWeb+Hosting account, Site Shield Addon is a great way of end to end encrypting your website. Great for privacy, great for security. For your visitors, financial transaction and personal data becomes more secure with Site Shield Addon. There’s also the bonus of better Search Engine Page Rankings as Google and other search engine providers rank secure (HTTPS) websites higher in their search results than non-secure websites. For your website visitors, the lock symbol in the search bar alone adds reassurance when visiting your site! If you have 10GB or higher EverWeb+Hosting account, Site Shield Addon is free. For those with a 2GB, you can easily purchase Site Shield Addon through your EverWeb Client Area. With every version of EverWeb we always aim to improve the speed and performance of the product, especially important if you are publishing large Projects. We’ve also regulary optimize the code that’s generated so your website will load faster for your users and be more responsive too. Look out for more news about faster publishing in the near future with the upcoming EverWeb version 2.6! EverWeb became a 64 -Bit product with the release of version 2.5. This is an important step, warranted by Apple’s drive to 64-Bit computing, both on macOS and iOS, over the last year. The move to 64-Bit also helps us take advantage of technology so that we can give you larger EverWeb Project files, better performance and more amazing features in the future. Importantly, we haven’t forgotten our users whose Macs are not 64-Bit capable. There’s 32-Bit version of EverWeb just for you. In addition to the Site Shield Addon in EverWeb version 2.4, we also introduced a new option for Language Localization. This option improves your website’s SEO for better search engine ranking results by using language localization to better serve visitors searching the web with more relevant search results. Language localization can be applied in EverWeb either globally to your whole website, globally but with specific pages overridden to use specific local language settings or just on an ad-hoc page by page basis. Language Localization is a great way to improve your website’s SEO and is great for multilingual websites or websites that target different geographic markets. There are many more ways in which we’ve improved EverWeb over the year: Shortcut keys to help improve your workflow, new and updated widgets, an improved Preview function, better RSS functionality, distance to object and much more! It’s been an exciting twelve months, but we’re not finished yet! EverWeb version 2.6 is on the horizon and packs lots of new and updated features to enjoy. We also have lots of exciting things planned for the next twelve months so stay tuned as there’s a lot of great stuff to look forward to! This is also a great time for us to get your feedback on EverWeb! What do you want us to add to the product, change or improve? What can we do better and how can we better serve you? Let us know in the Comments section below, we are here to help and look forward as always to your feedback! This entry was posted on Thursday, November 16th, 2017 at 8:31 pm	and is filed under EverWeb, EverWeb, Software, web site optimization. You can follow any responses to this entry through the RSS 2.0 feed. You can leave a response, or trackback from your own site. I am waiting for the Polish language version all the time. When will he appear? Thanks for the request, I will forward it to the development team to see if we can include Polish!